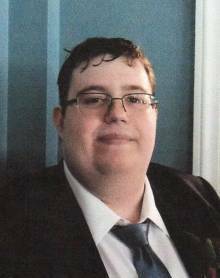 Shortsville - Adam Winters Breese, 22, entered eternal rest on Saturday, November 10, 2018 at Strong Memorial Hospital after a brief illness. Family will greet friends on Wednesday, November 14 at the Halsted-Patrick Funeral Home from 3 to 6 PM. followed by a brief prayer service. In lieu of flowers, donations in Adam's memory can be made to Strong Memorial Hospital Advanced Heart Failure Program, 601 Elmwood Ave, Rochester, NY 14642 or Happy Tails, 2976 County Road 48, Canandaigua, NY 14424 or Caring Bridge at www.caringbridge.org. Adam was born the son of Stephen and Brenda (Winters) Breese on Wednesday, October 2, 1996, in Canandaigua, NY. He spent his life in the Shortsville area, graduating from Red Jacket High School, Class of 2014. He worked at Walmart in Canandaigua as a sales person and he enjoyed spending time with his dog. Adam will be lovingly remembered by his parents, Stephen and Brenda (Winters) Breese; brother, Owen (Lauren) Breese; maternal grandparents, Clarence (Connie) Winters; several aunts, uncles and cousins; and beloved dog, Jinx. Adam was predeceased by paternal grandparent, Ken and Kate Breese.